It may not be at the top of every traveller’s bucket list, but Timisoara is a city you’re going to be hearing about a lot more in coming years. Which of course means it’s best to book your flights now, while it’s still relatively undiscovered. 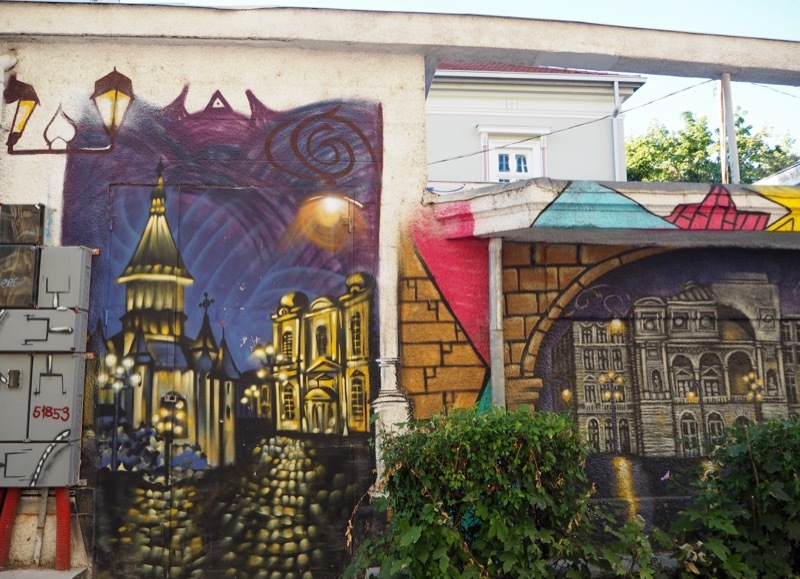 Since being named the 2021 European Capital of Culture, the Romanian city of Timisoara has been pulling out all the stops to get their city ready for the events that’ll be happening in four years’ time. But there’s really no need to wait until then to visit. With cheap flights, Instagrammable pastel-coloured buildings and epic summertime weather, it’s the perfect destination for a great weekend getaway. Don’t believe me? Take a look at what Monica, Ari and I got up to when we visited recently after being invited by a local, Mihaela Codre, to see what her city has to offer. And if that isn’t enough to convince you, here are 10 great reasons to choose Timisoara for your next city break. Persuaded? Great! 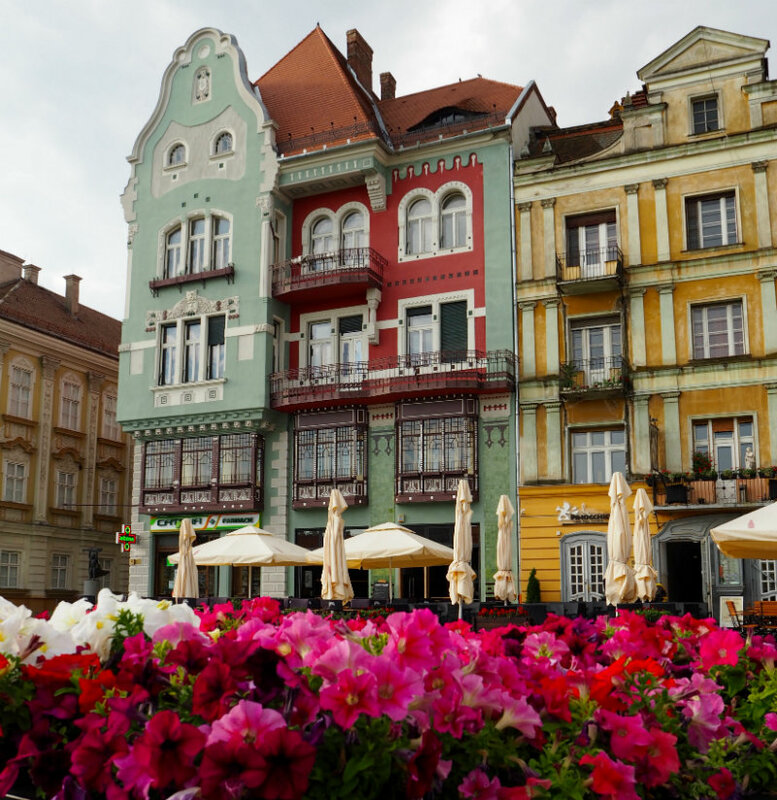 Here’s The Travel Hack’s guide to Timisoara, for all the information you’ll need to discover this up-and-coming destination. At the moment, there are only two direct routes from the UK to Timisoara, and that’s with Wizz Air from London Luton, or Ryanair from London Stansted. Either way, the flights are cheap (I’ve seen them for as low as £28 return), and short, with a flight time of around 2 hours 45. There’s a time difference (Timisoara is 2 hours ahead of London), which is worth bearing in mind when booking. Take a look at Kayak to find your flight. Express bus 4 goes from the airport to the city centre, which is definitely the cheapest option (I read somewhere that a ticket is 2.50 Lei – around 50p – but I don’t know how current that information is). When we arrived, we got a taxi, which was 60 Lei (or £12), the easiest option for us, as we arrived late at night and our hotel wasn’t in the city centre. The journey took around twenty minutes. With temperatures in winter plummeting to -40 or so, I’d probably avoid travelling to Timisoara in the coldest months (although it could be a fun Christmas market destination). 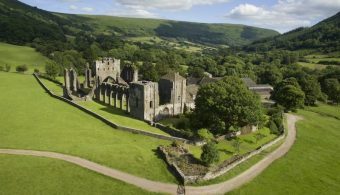 Summer can get pretty extreme too, with the mercury soaring above 40 degrees on a regular basis, so if you’re looking for milder temperatures, think about a spring trip. If you don’t mind the scorching heat though, summer is a really great time to visit, as the long nights mean afternoons spent lounging by the pool and lazy evenings spent relaxing along the river with the locals. You can see all of Timisoara’s main sights within 48 hours, which makes it the perfect weekend getaway – arriving Friday night and getting home on Sunday, in time for work on Monday morning. Any longer than that and you’ll want to rent a car to see what lies beyond the city limits. 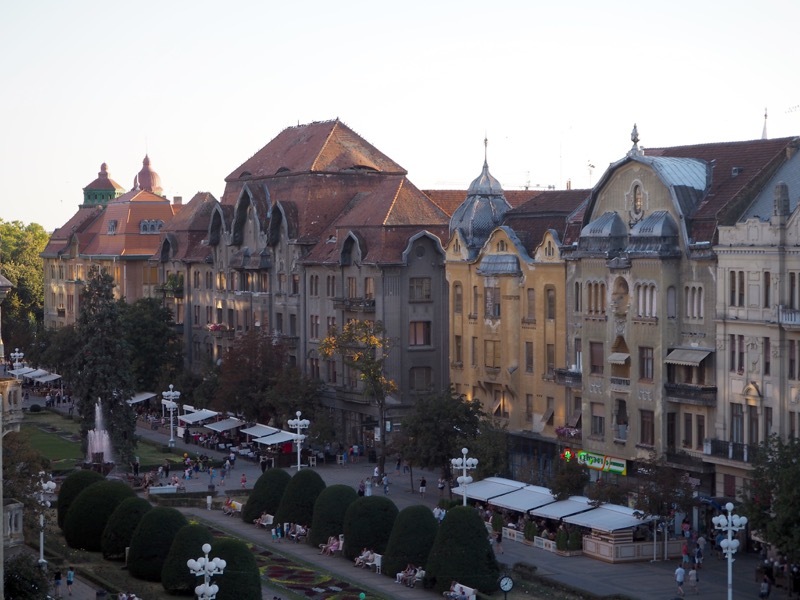 Timisoara is a truly affordable destination for a city break. Flights are cheap, you’ll get great value for money on your accommodation, and the prices of meals and entertainment are incredibly low, especially when compared to the UK. The currency is the Leu (plural Lei), and at the time of writing, 1 Leu is the equivalent of 20p. I wouldn’t recommend taking a huge amount of cash with you, only because you probably won’t spend it all. There are ATMs at Timisoara airport and around the city if you haven’t arranged any currency before you departed the UK (or if you couldn’t find it – not all currency exchange locations carry Lei). For a better idea of how much you’ll need, check out this post on how much a weekend in Timisoara will cost. 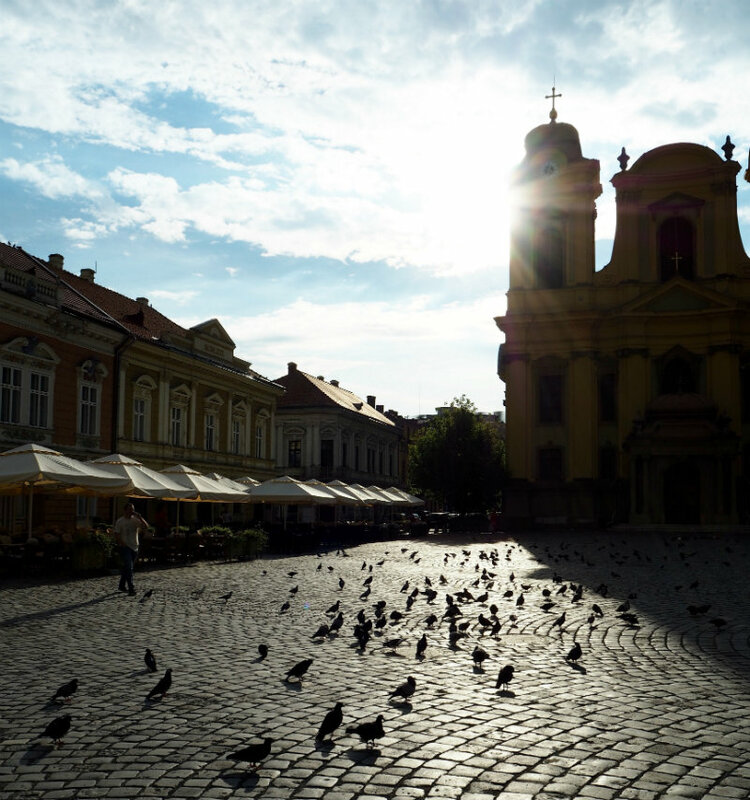 Timisoara is a small and compact city, which makes it perfect for a weekend break as you don’t spend all your time trying to get between sights. 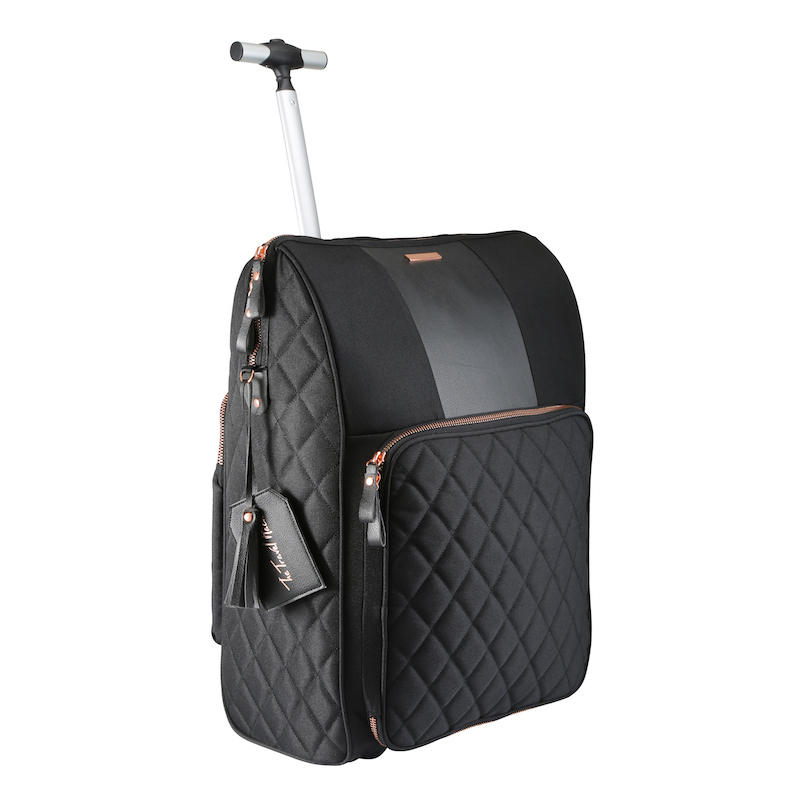 This means that the best place to stay is right in the city centre. Hotel Timisoara is apparently where the president stays when he’s in town, and it’s super close to most of the city’s main attractions. With rooms from around £50 a night, it’s a really affordable and central option. Alternatively, there are some excellent Airbnbs that are close to the centre of Timisoara – I’ve seen a couple for around £30, which is amazing if you’re splitting it between two people (or even if you’re travelling solo)! We had some great meals in Timisoara, and we also went to (or spotted) a bunch of great bars that are worth a visit. I’m sure there are plenty more than what I’ve listed here, but these are a few recommendations to get you started on your culinary quest! Our hotel served breakfast, but we went one morning to see what else there was in town, and stumbled upon Neata, an omelette bistro. Yep, you read that right. A whole restaurant dedicated to the humble omelette. The interior was really trendy, the staff were friendly and the food was delicious – try the four cheese omelette, it’s incredible! There are plenty of places right in the centre of town to grab a bite to eat that thankfully you don’t have to go far. For traditional fare such as goulash and polenta, go to Restaurant Timisoreana right in Victoriei Square overlooking the fairytale-like Orthodox Cathedral. I’ll be honest, Romanian dishes are hearty, but they’re not as flavourful as I’d hoped for. Still, worth a try (and cheap, which is always an added bonus). Just a few doors up is Restaurant Lloyd, an upmarket lunch spot with a stunning interior and lovely terrace serving modern fare overlooking the pigeon-filled square, perfect for leisurely people-watching. Look up and you’ll see a cluster of yellow umbrellas above the square. That’s Craft, a rooftop bar and restaurant that you’ll want to visit for dinner as the sun’s setting over Timisoara’s rooftops. The menu is modern, with pizzas and pasta featuring heavily, and you can’t visit without trying a refreshing mint lemonade. So good. Further into the centre of town you’ll see cafes and restaurants lining the edge of the pretty pastel-coloured Unirii Square. We ate at Stradivarius, which served good food (nothing too memorable, although not bad either), but the real appeal is the view of the Baroque buildings all around you. And finally, check out Amphora in the city’s Bastion (the old city walls). It has a gorgeous terrace and serves really delicious food and wine in a historic setting. Don’t even think about leaving Timisoara without visiting Massimo, an Italian gelateria that always has a queue, and for good reason. Try the lime sorbet for a super refreshing afternoon snack, or the dark chocolate gelato for an after-dinner treat. If cake and pastry are more your thing, you’re in luck. Cofetaria Trandafirul near the Bastion serves sugary confections in a pretty cafe reminiscent of a British tea house. There’s also the pastel-coloured Senneville near Unirii Square, which has an enormous selection of cakes and pastries, with tables to enjoy your treat on the sidewalk as you watch the world go by. The riverbank comes alive when the sun’s gone down and the temperatures dip enough to be comfortable. There are loads of options to choose from, they’re all outdoors and have great decor and the atmosphere to match. Start at La Capite or Vineri 15 for chilled out riverside vibes. Start at the Orthodox Cathedral, the tallest cathedral outside of Russia at 90.5 metres, with a Disney-like exterior and an interior dripping with gold. It was here, on the steps outside, where the Romanian revolution of 1989 began, so it’s steeped in history as well as beauty. 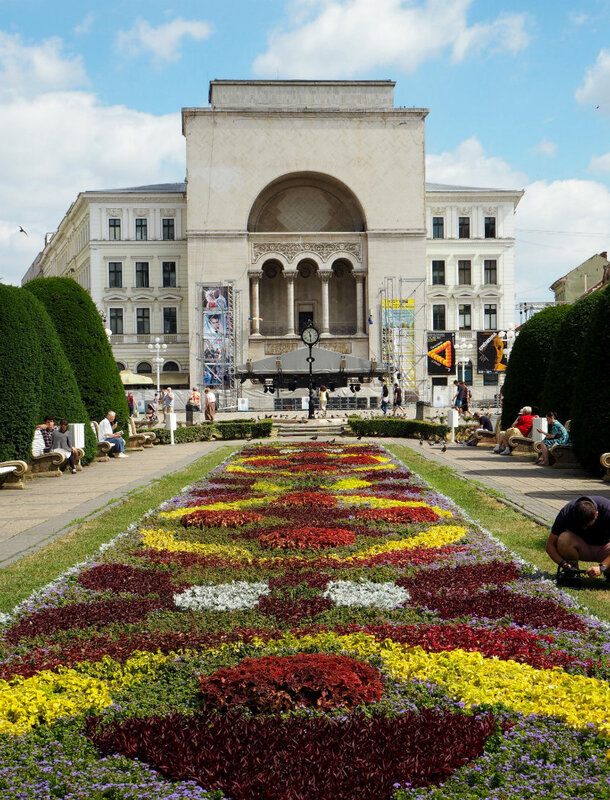 Get your art fix at the Art Museum in Unirii Square. The building – a Baroque palace – is stunning and if you’re lucky you’ll catch a memorable exhibition like the one we saw (called Meating by German sculptor Virgilius Moldovan). Don’t miss the Communist Consumers Museum, a quirky basement on a residential street packed to the rafters with household objects from Romania’s years before the 1989 revolution. And you’ll want to stop here for a drink, too – the weird and wonderful bar and beer garden are open until 11pm. Unirii Square! Honestly, I can’t say it enough times, but this square is so stunning. It’s home to a number of pastel-coloured Baroque buildings as well as an Armenian Church, a Catholic Cathedral and the Trinity Monument that serves as the square’s centrepiece. There’s also the Opera House in Victoriei Square, designed by the same architect who created the famous Vienna Opera House, which is how Timisoara gained its comparisons to the Austrian city. There are plenty of breathtaking buildings in the city, but these are a few highlights to get you started. Timisoara is a really green city, with loads of parks to choose from, as well as the Bega River snaking around it. Take a stroll through the Rose Park, which lives up to its name. Just across the road is the Children’s Park, which is a pretty incredible adventure spot for young travellers. There’s crazy golf, a bouncy castle slide, trampolines, play equipment and way more. Rent a pedalo to make your way lazily down the river, watching the world go by in the sunshine, and if you’re looking to really get into nature, head out of the city to the Recas wine region or to discover the adventure park at Herneacova. If you visit Timisoara in the summer, the public pools are a must-do. There are a few to choose from around the city, but the most convenient one is probably Thermal Resort ZHH, right on the river, just a short walk from the city. 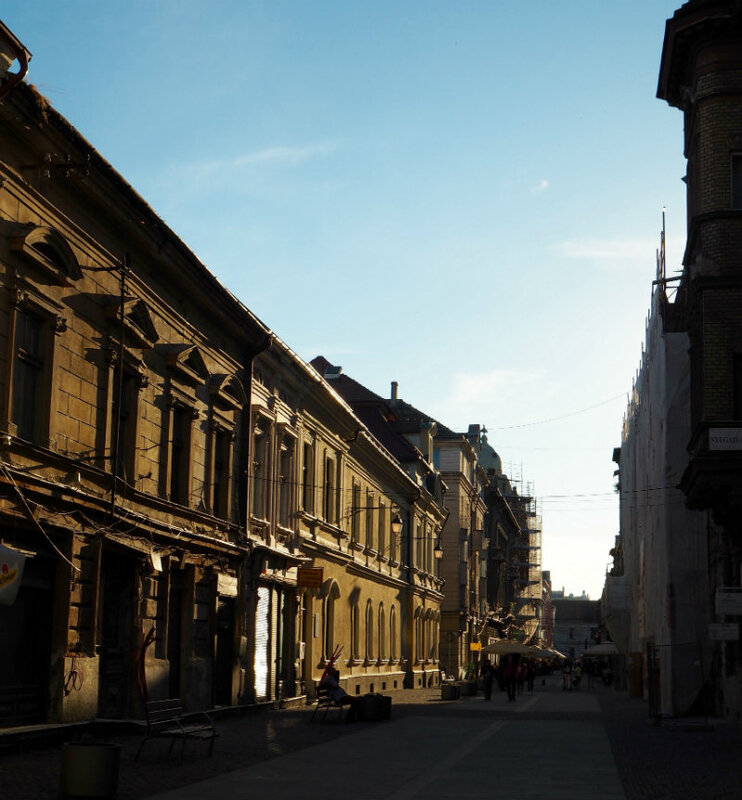 Here’s where the locals while away the hottest hours of the day, followed by dinner and drinks in the nearby bars and restaurants – the perfect ending to a spectacular day in Timisoara! I will have to add this spot to the Worldwide McCool Travel Gelato Tour! Actually, my great-grandparents lived just a few miles/kms from Timisoara until the early 1900s. That is the main reason I want to visit. Thank you for this beautiful blog post. I have seen repetitive blog posts featuring the exact same destinations and activities which makes me think that people are going to various cities and countries due to trend. Don’t get me wrong, Marrakech is nice, but “influencers” are taking the same pictures and staying at the same hotels. That being said, thank you again for this breath of fresh air. I’d only vaguely heard of Timisoara before I read this post, but you’ve definitely sold it to me, Elle! Love the idea of an omelette bistro (who can resist a good omelette?! ), and the Communist Consumers Museum sounds so interesting, to see what life was like behind the Iron Curtain. One of my travel resolutions for 2018 will definitely be to visit more obscure places, and Timisoara sounds perfect.